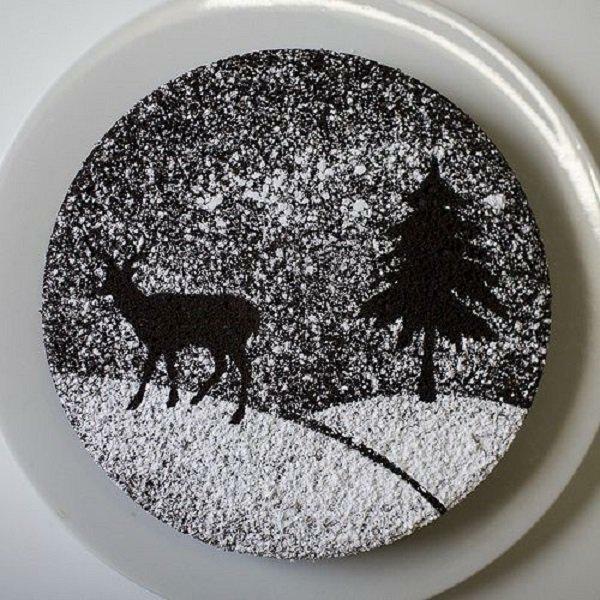 Delicious looking deer-inspired Christmas cake. 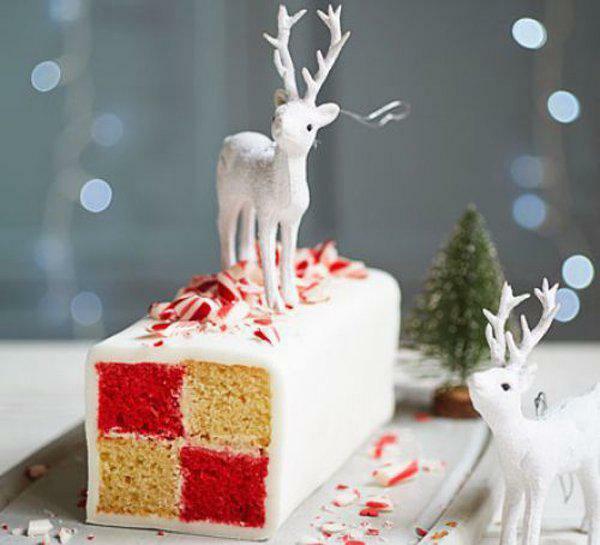 The cake takes inspiration from Santa’s deer and adds the popular Christmas color theme which is red and white. Complete with candy canes. Christmas is in the air once again! And what is the best thing about this season? It’s not just the gifts and the bonuses and the snow, but the food too! This is the time of the year where you can showcase your cooking skills and try to bake one of the best Christmas cakes out there. Not only are you celebrating the season but you are also unleashing your creativity and using what you have learned about baking and mixing together the most unique and flavorful ingredients together. How to bake the perfect Christmas cake! Of course, since it is Christmas you will always want to show off your cooking skills and put those baking gloves to work. You might have thought about what you can prepare for Christmas for the entire year and it comes down to this season that you will finally put your master skills at work. If you love baking then making a unique and tasty cake would be no problem. If you have collected ideas then it is the perfect time to bake them into reality. Memories of your first ever Christmas cake may flood your mind and it will always be one of the most special because you know that you have put your heart into it and this time around you want to improve and show to everyone that you can only get better at baking. If this will be the first Christmas cake that you will bake then it is your tie to shine and impress everyone at the dinner table how you were able to come up with such a wonderful pastry. Other than gathering all the ingredients and perfecting your skills, one of the most important ingredient in baking a Christmas cake is that you should put your heart into it. Even though some may be skeptical, it really makes a difference when you make something and put all your heart into it and everything simple becomes even better. Nowadays some of the more popular Christmas cakes are made out of fruit, triple chocolate combined with pined-scented mince pies completing the homey feeling that Christmas gives plus the familiarity of the Christmas songs and the cold breeze make the perfect atmosphere. If you’re going with this theme then it is up to you as long as you have an idea on how to make it different and taste better than the other cakes that you have baked or tasted before. However if you have ideas of your own and recipes you’d like to try out the you are also free to do so. You can even use these regular Christmas treats as a theme or an inspiration for your new pastry creation. When you’re serious about making something new that you haven’t tried before, always remember that you should consider the ingredients carefully. Sometimes the kind of ingredients that you put will affect the taste and the feel of your Christmas cake. Some of the more common ingredients used include eggs, butter, sugar, spices, fruits and in some cases wine and beer. These combine make the cake much more exciting and flavorful however, you should also know how to combine them correctly so that the cake doesn’t taste bland and awful. Basically you are free to choose the ingredients that you like given that they blend with each other and will not cause an upset stomach. One of the most popular types of cakes that people always make and eat in this season is the fruit cake. It is one of the things that you will never miss in Christmas and it even tastes even though it is cooked with raw batter. It tastes good no matter how you bake it and that’s what makes it a favorite to be baked. The good thing about this is that they can be improved over time and you can even drip -feed it with alcohol as they start to mature; this makes the flavor even better. This is also where the stir-up Sunday tradition started. The cake adds the trinity of delicious fruits together with mincemeat and Christmas pudding. Another popular cake in Christmas is the Lincolnshire plum loaf which is also comprised of dried fruit that has been baked by the British using fruit breads and in the long run turned into cakes. Nowadays the yeast has been changed to eggs and it contains around seven egg whites that have to beaten to turn into a stiff snow. After which it should be added to the mixture of the cake. This makes the the cake even more flavorful. You also have Annie Bell’s recipe Christmas cake where it uses bicarbonate of soda as the ingredient to raise the cake. It is added to a warm pan filled with melted butter combined with apple juice. You can then see the fizz that appears. The wonderful thing about this cake is that it is very light in texture and you won’t even notice that you’re actually eating fruit. It’s simple, light and definitely a good treat. Whatever type of Christmas cake that you bake, what’s important is that you love what you are baking and that you have prepared for it. You have the entire year to plan the best Christmas cake to bake and you should make the most out of it. Whether or not you have a theme or you simply want to bake your favorite cake,make sure to make it the most tasty and the most delicious cake that you have ever done in your life; it will pay off in the end. 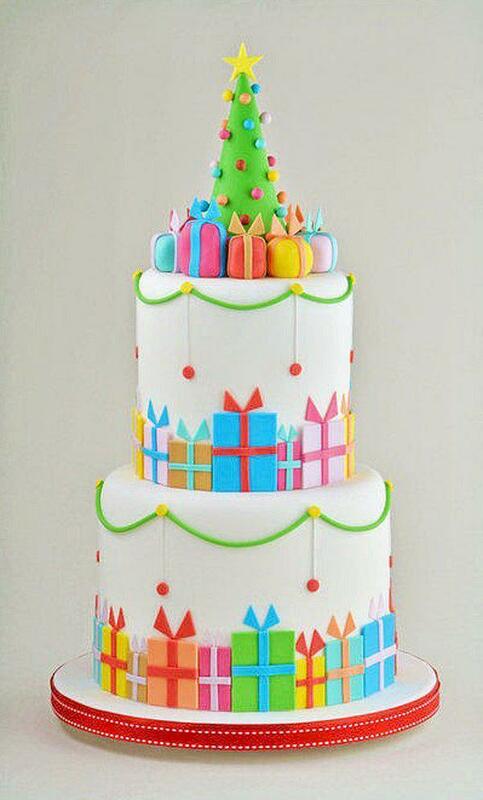 Colorful looking Christmas cake. The cake looks even cuter because it is designed to look like a huge doughnut with drip icing and candy sprinkles on top. Rudolph the red nosed reindeer inspired Christmas cupcake. 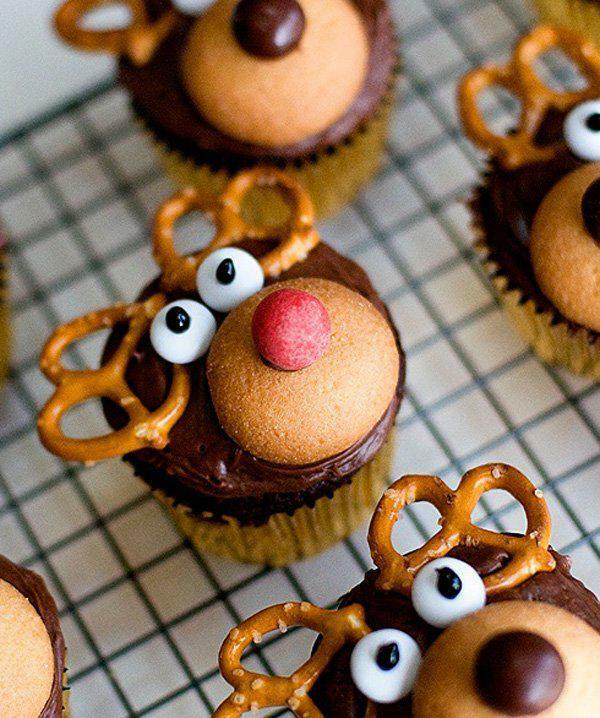 The chocolate cupcakes are designed on top to look like Rudolph and his shiny red nose with knotted pretzels as the antlers and icing as the googly eyes. Santa inspired Christmas cupcake. 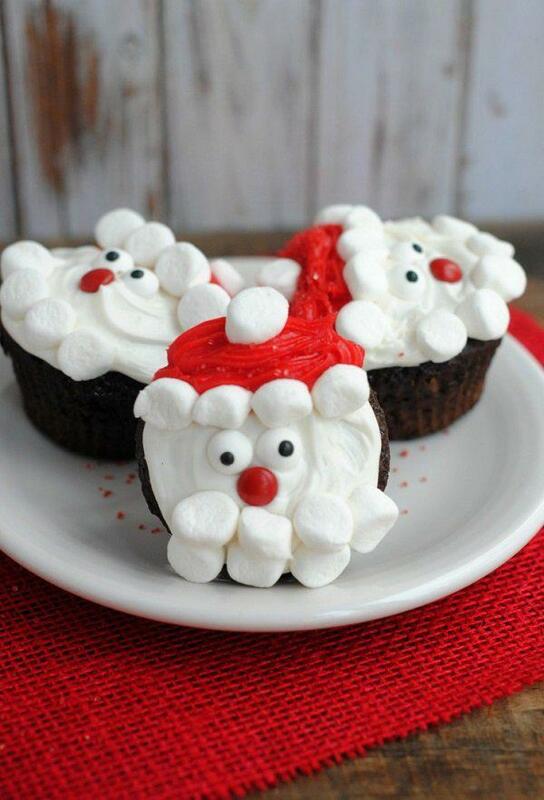 The chocolate cupcakes are designed to have Santa’s cartoon face on top with the use of red and white icing. Christmas town inspired Christmas cake. The three layer cake is designed to look like a typical Christmas town at night filled with snow. In the skies you can see the silhouette of Santa riding the sleigh with his reindeer. 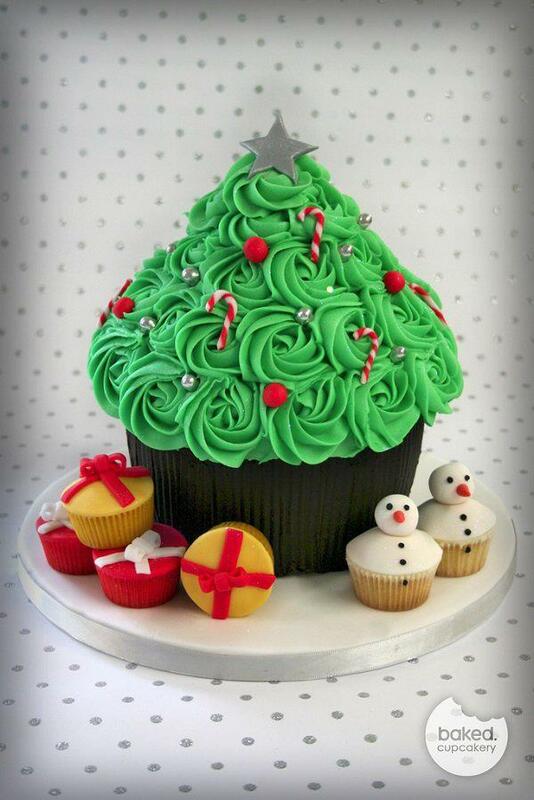 6.Wonderful looking and truly delicious tasting Christmas cupcake. 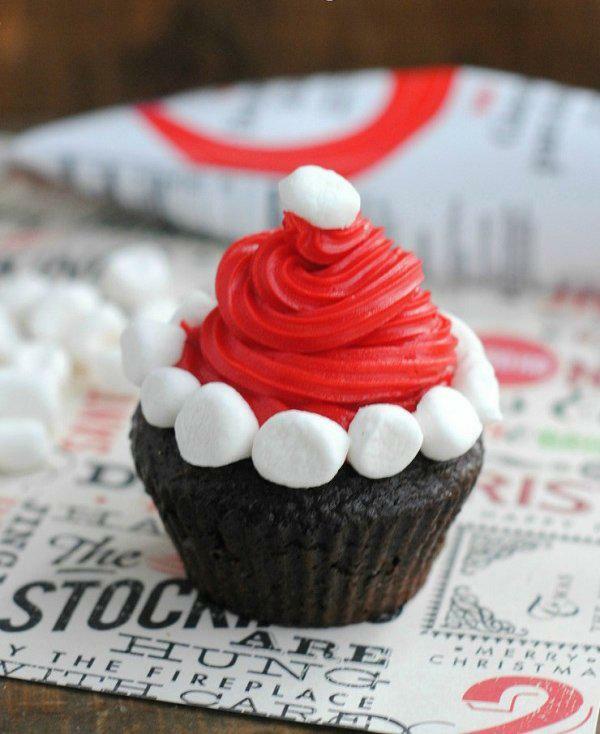 The cupcake decoration is designed to look like Santa’s Christmas hat with the help of white marshmallows and red icing to complete the look. 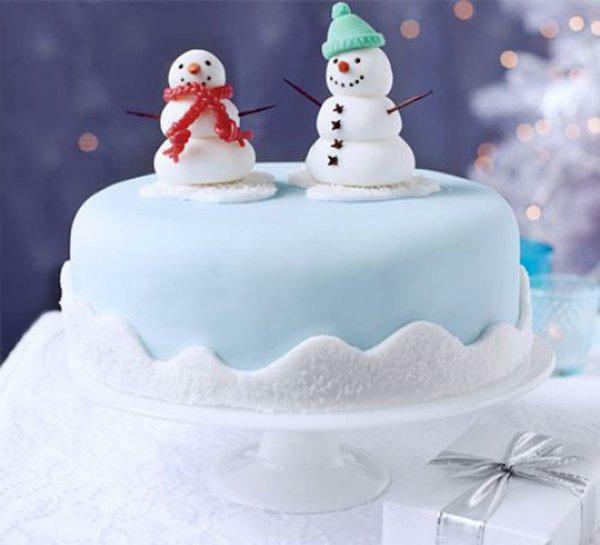 A very cute Christmas cake with a snowman couple on top. The cake is designed to look like a snow yard with two cute snowmen on top that looks like a cute couple under the snow. Christmas tree themed Christmas cake. 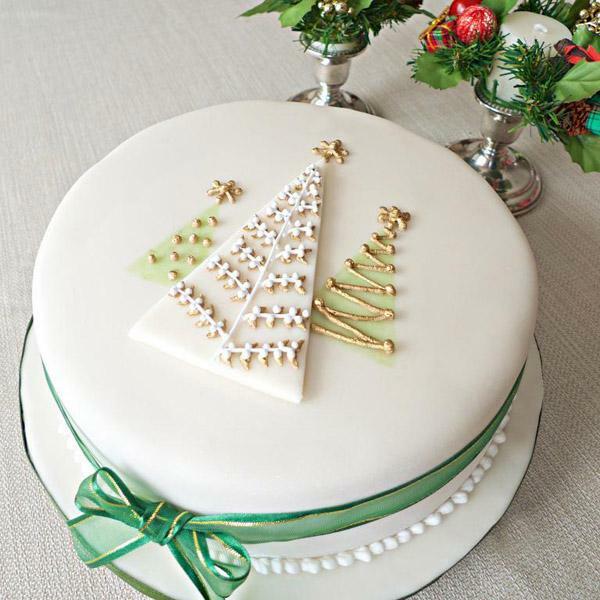 The Christmas cake is designed to look like a Christmas tree complete with a mistletoe and Christmas balls hanging around the tree. On top the icing has been designed to look like a ribbon. 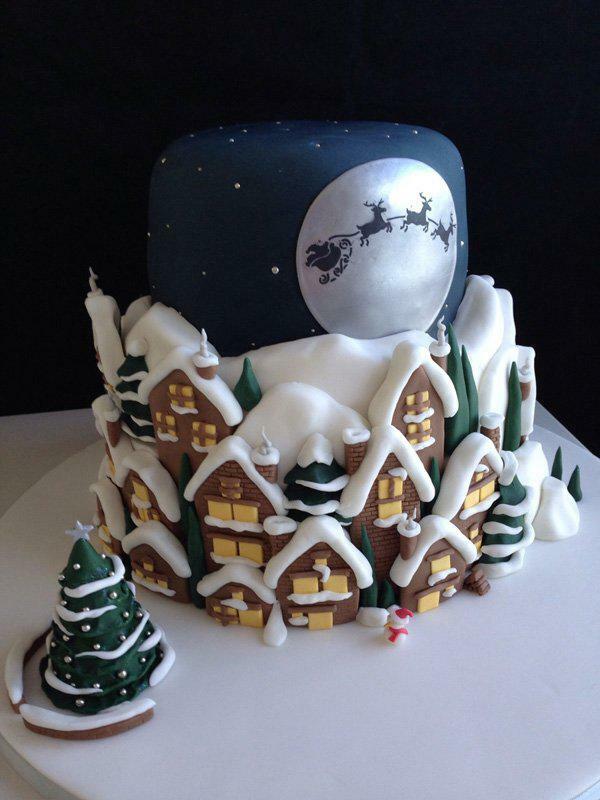 Beautiful looking Christmas cake. 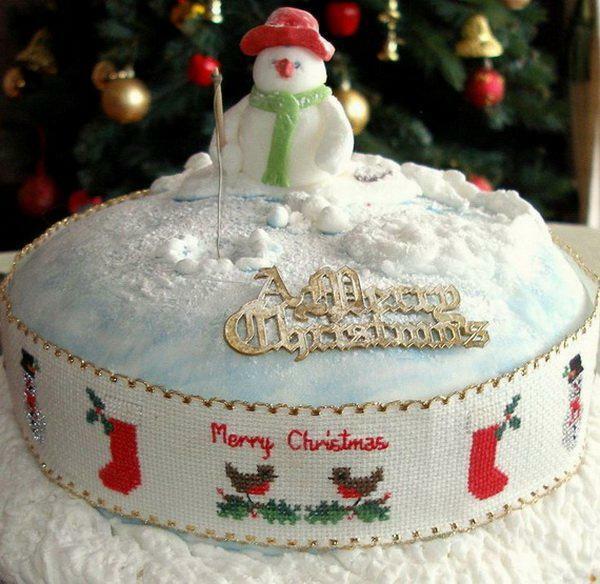 The Christmas cake is designed to look like a snow filled lawn with snow sprinkles surrounding a modest looking snowman with a hat and scarf. 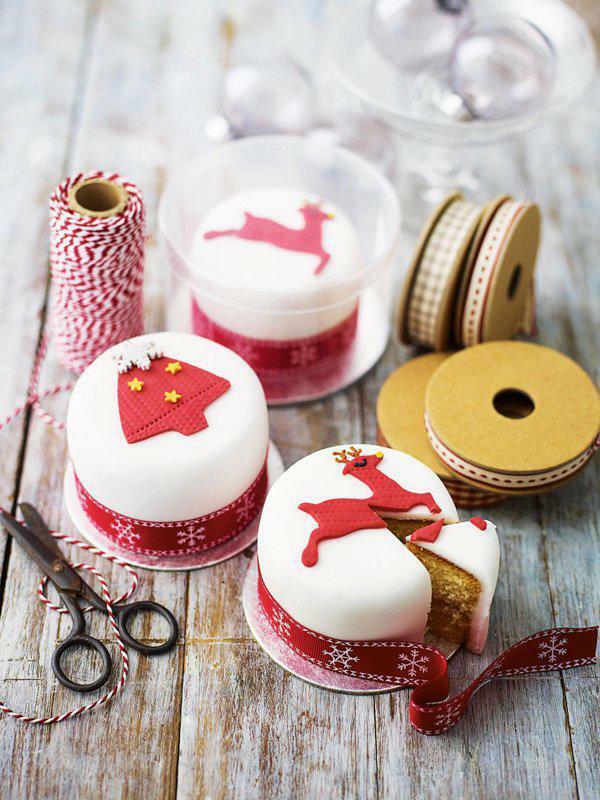 Really cute and adorable looking Christmas cakes. 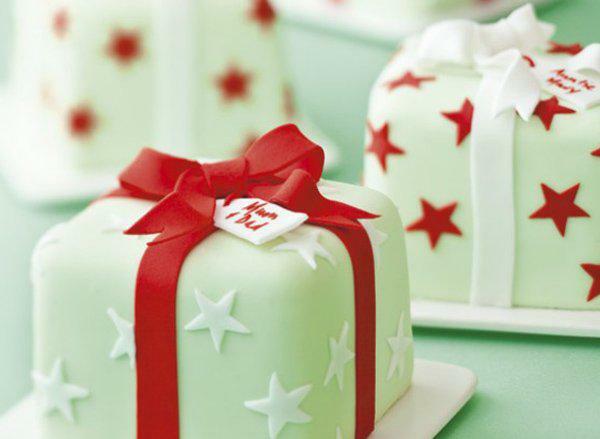 The cakes are made to look like little Christmas presents with star patterns around it and a red ribbon wrapping them up. Polar bear inspired Christmas cake. The cake looks like the snowy terrains of the north pole as the polar bear is happily sliding around on the white cold snow. Christmas tree inspired Christmas cupcakes. 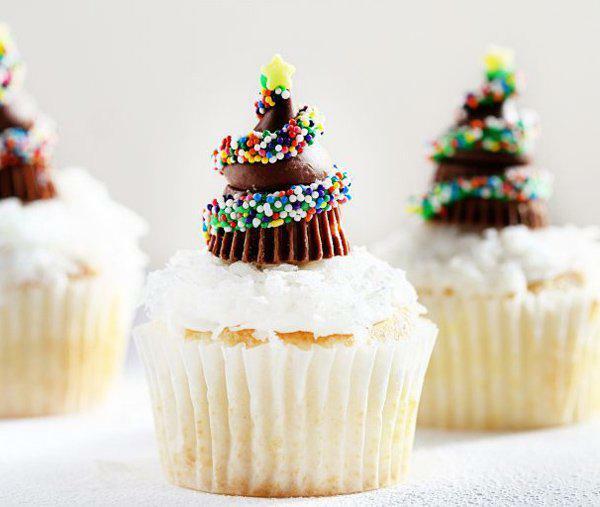 The vanilla cupcakes are topped with chocolate toppings formed to look like Christmas trees surrounded by colorful candy sprinkles. Two layer Christmas cake designed to look like gifts. 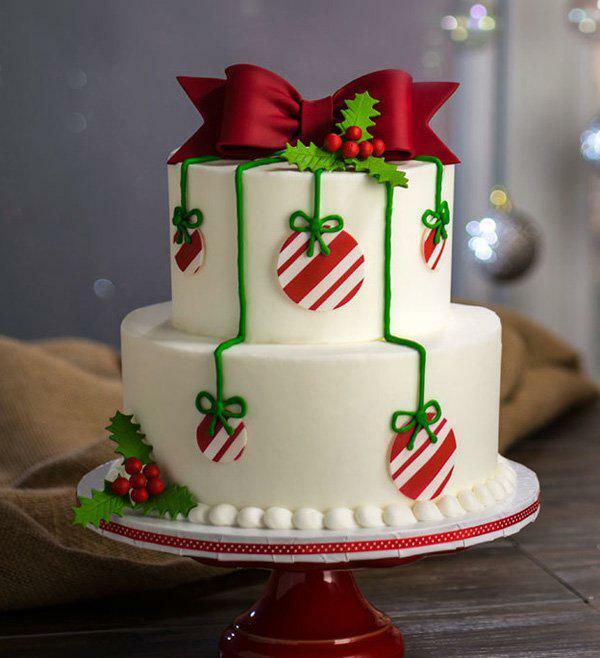 The cake is creatively made to look like two beautiful Christmas gifts on top of each other, complete with Christmas wrappers and ribbons fit for the occasion. 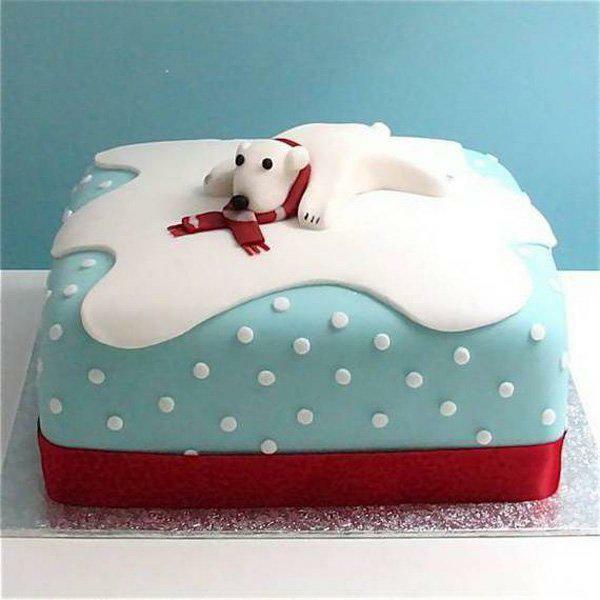 A really cute and comical Christmas cake. 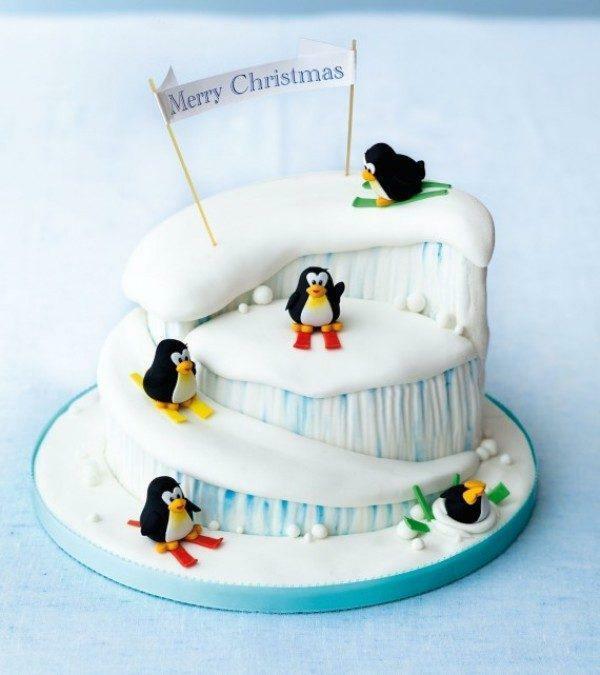 The cake is filled with cute little penguins on colorful sleds as they happily play around the ice celebrating a cold but fun Christmas. Snowman inspired Christmas cupcakes. 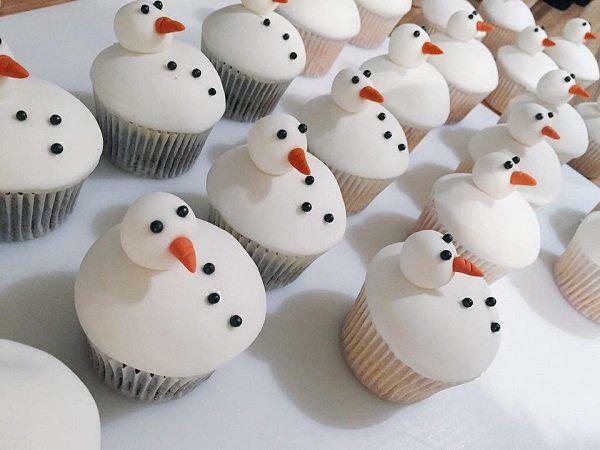 The cupcakes are designed to resemble a snowman with buttons and a carrot nose. It looks yummy and at the same time adorable. Gift themed Christmas cake. 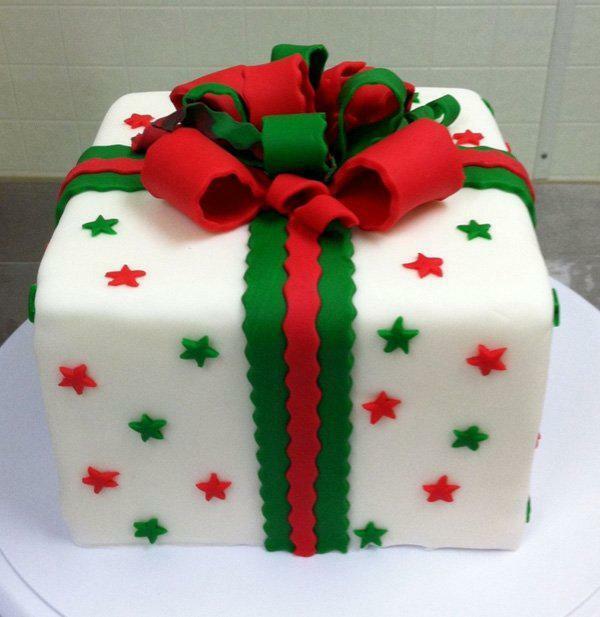 The cake is decorated to look like a Christmas gift complete with stars as the wrapper decoration and a red and green Christmas bow. Embroidery items inspired Christmas cake. The little cakes around are made to look like parts of an embroidery project and that’s what makes them look so unique and vintage. 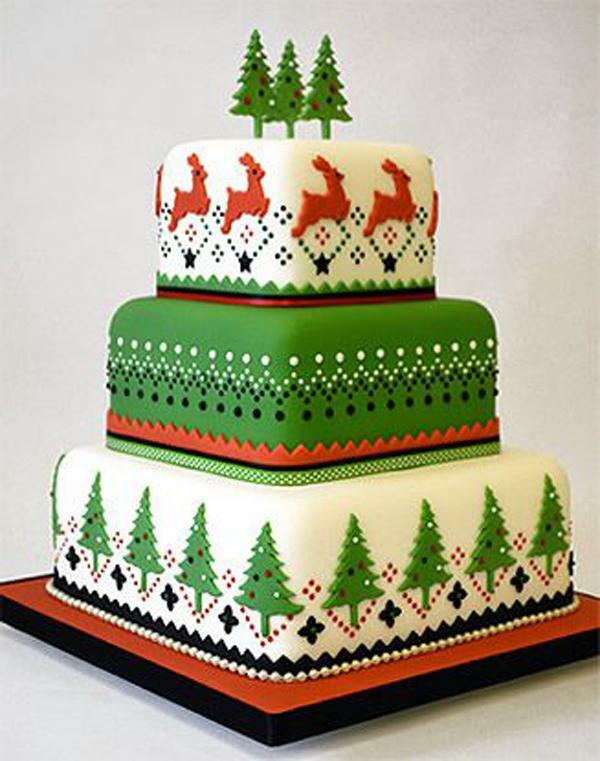 Beautiful looking Christmas cake with a silhouette design. The design on top has been made to look like a peaceful snowy Christmas evening in the woods with pine trees and a solitary deer roaming around. Pretty looking tea Christmas cupcakes. 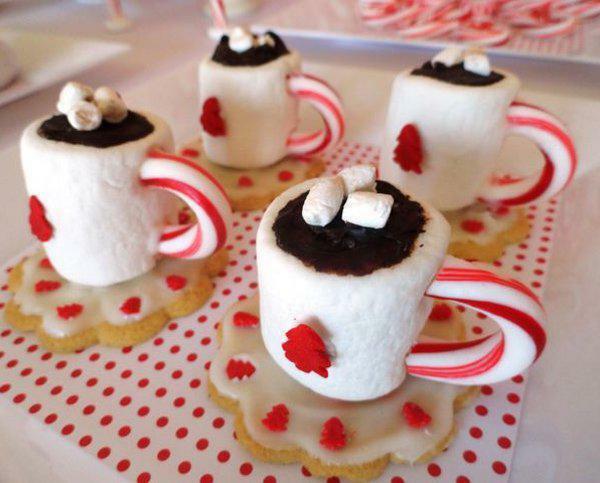 The mini cakes have been made to look like small mugs of hot choco with marshmallows on top and candy canes as the mug handle. 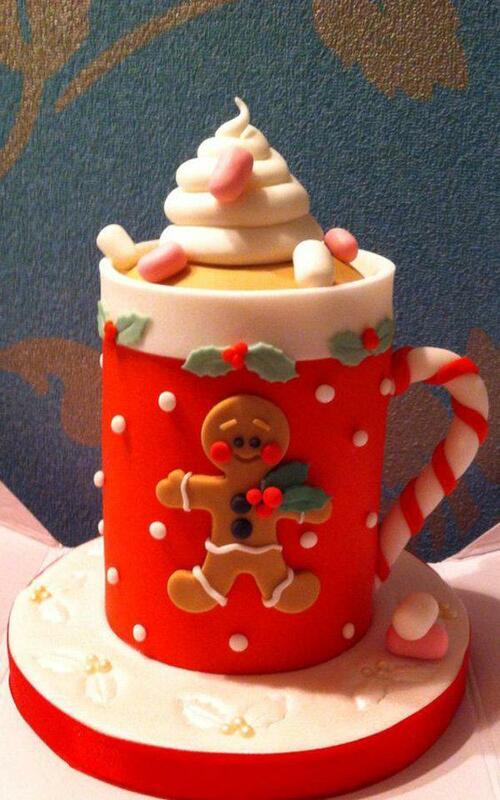 Beautiful mug themed Christmas cake. The design on the mug is also inspired by the gingerbread man who is also a popular figure during Christmas season. 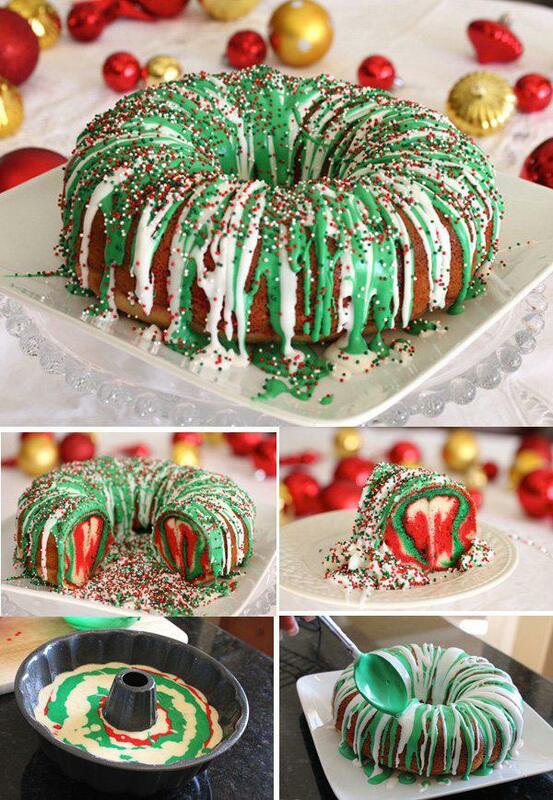 Wonderful looking Christmas themed cake. The cake has a Christmas tree design on top surrounded by presents and snowflakes in cartoon version which makes the cake look adorable. Snowflake themed Christmas cake. On top of the cake you can find small cartoon versions of Santa and a snowman. You can also find a small Christmas tree in the middle completing the design. 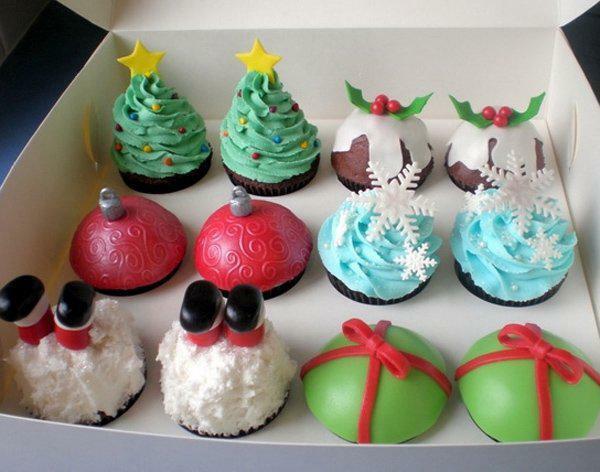 Adorable looking Christmas cupcakes. The cupcakes are decorated with wreaths and Santa hats as designs making it look perfect for just about any Christmas parties out there. 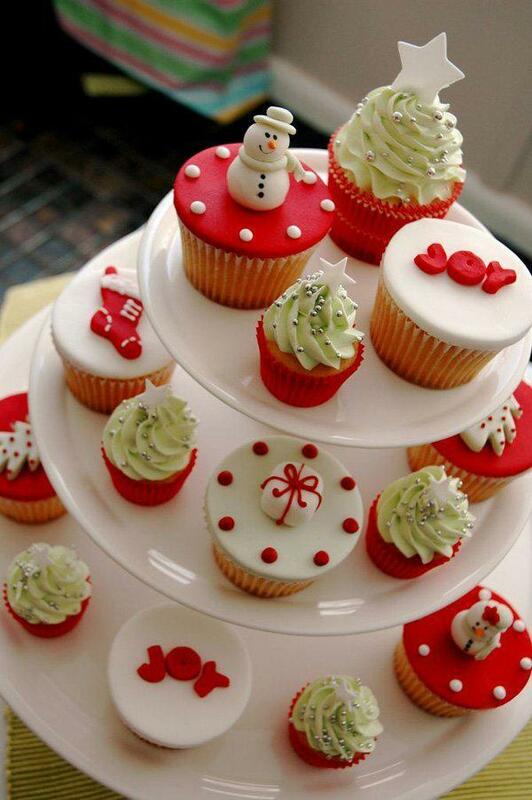 Cute little Christmas cupcakes in different designs. The designs on the cupcakes look very adorable and humorous as you can even spot an upside down Santa who has crashed into the snow as one of the fun designs. A tray of wonderful looking Christmas inspired cupcakes. The cupcakes are designed differently from one another each embodying a symbol for Christmas and they simply look perfect when grouped together. Mistletoe inspired Christmas cake. The cake is designed o look like small volcanoes with icing sprouting form the middle on top of the cake, small mistletoe designs are added to complete the effect. 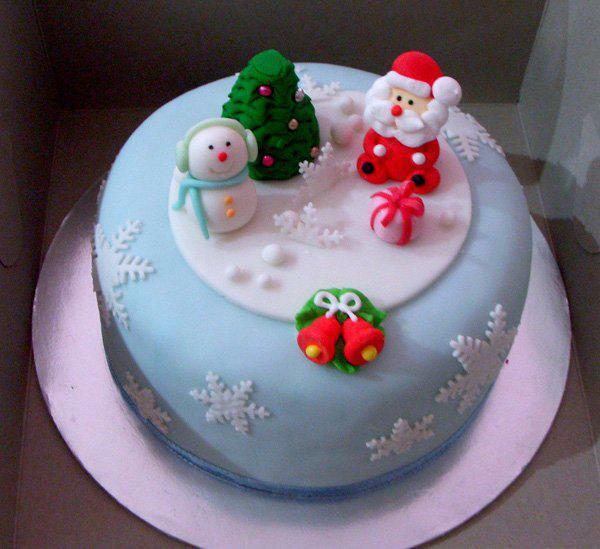 Really cute and yummy looking Christmas cake. This design is simply adorable because of how creative the mini cakes look like. They are designed as Christmas trees and their stand is made up of candy canes. Pine tree inspired Christmas cupcakes. The chocolate cupcakes have been topped with green icing decoration to mimic a pine tree on the snow and designed with silver colored icing to look like shiny Christmas balls. 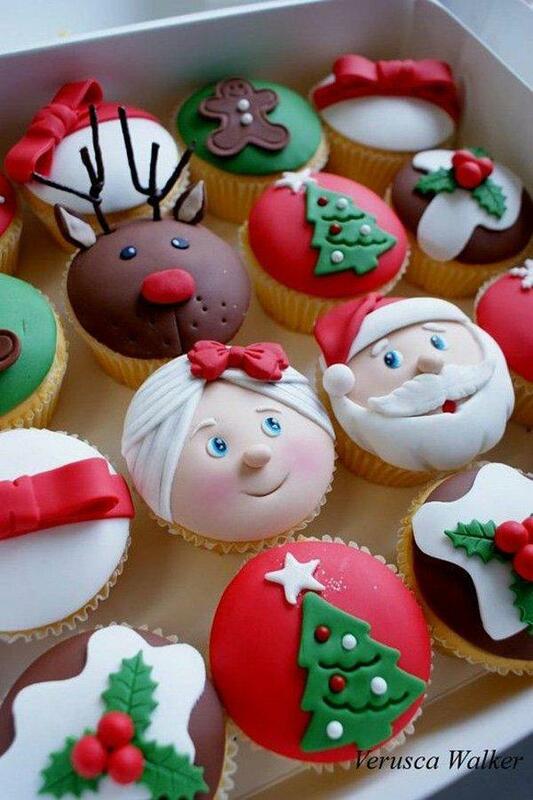 Funny and adorable looking Christmas cupcakes. The cupcake designs feature Santa in cute ways such as his big smiling face as well as an upside down Santa who trips on a mistletoe with his feet sticking up in the air. Adorable little Christmas cupcakes with Christmas designs. 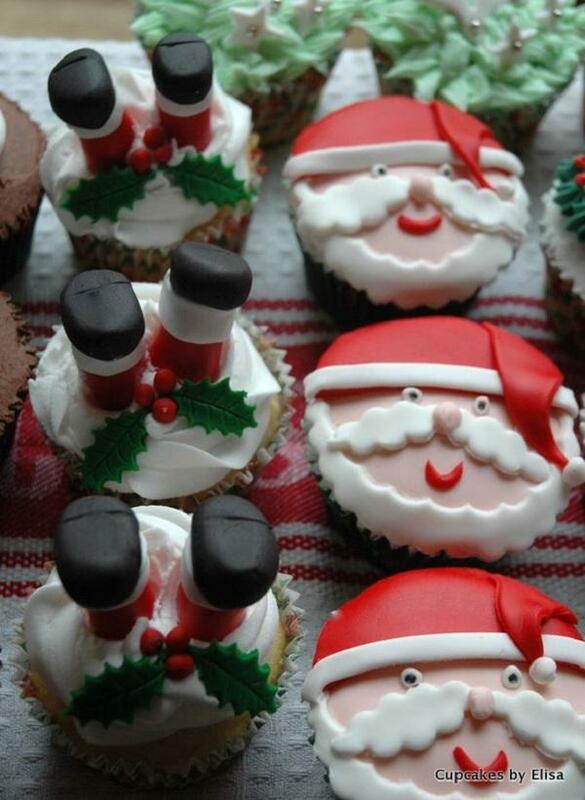 Each cupcake features different designs relating to Christmas from Santa to gifts and candies. 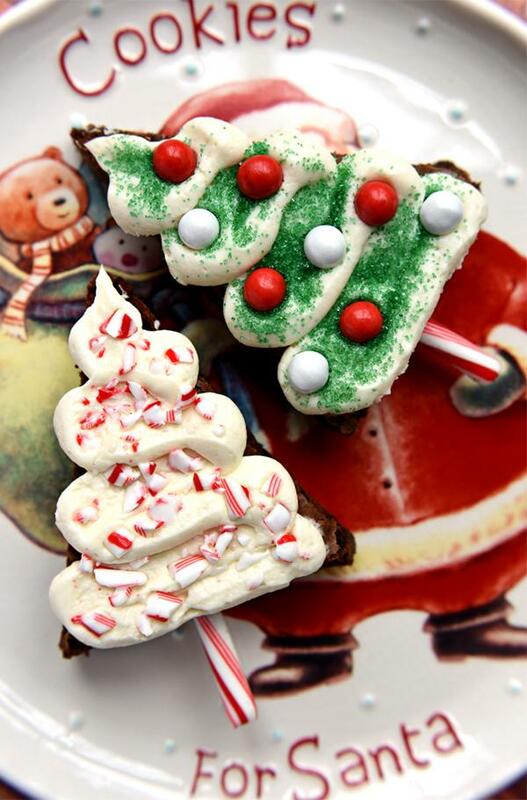 Richly colored chocolate Christmas brownies. 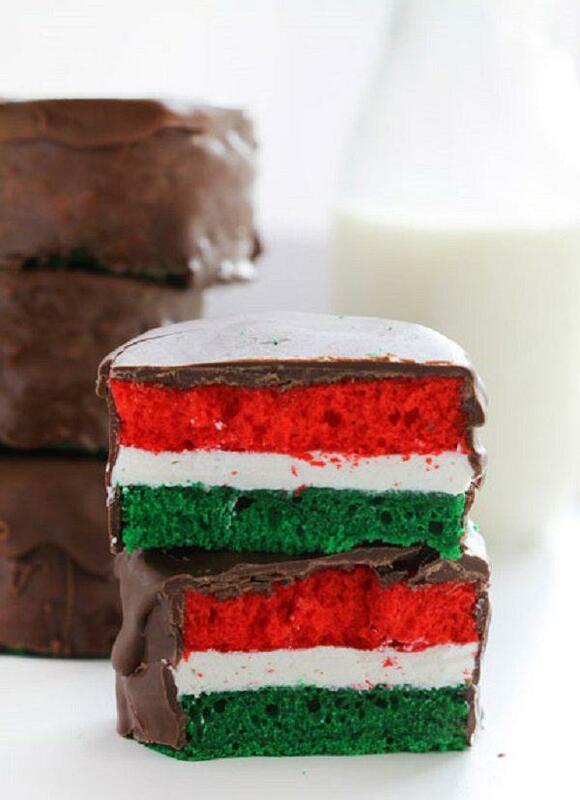 Even though the brownies look plain outside, the inside has been colored in relation to the popular Christmas color theme of red, white and green combination. Three layered Christmas cake inspired by Christmas trees. The cake has a white and green color theme that makes it look cool to the eyes and pleasant to eat. 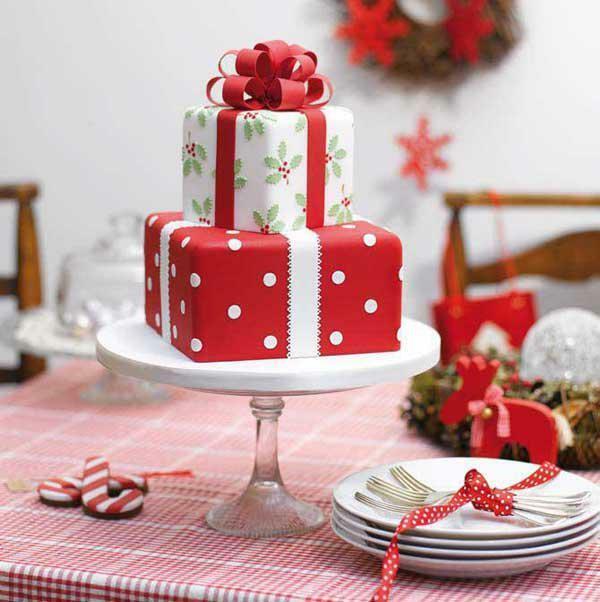 An adorable Christmas cake design featuring all the popular Christmas toys. 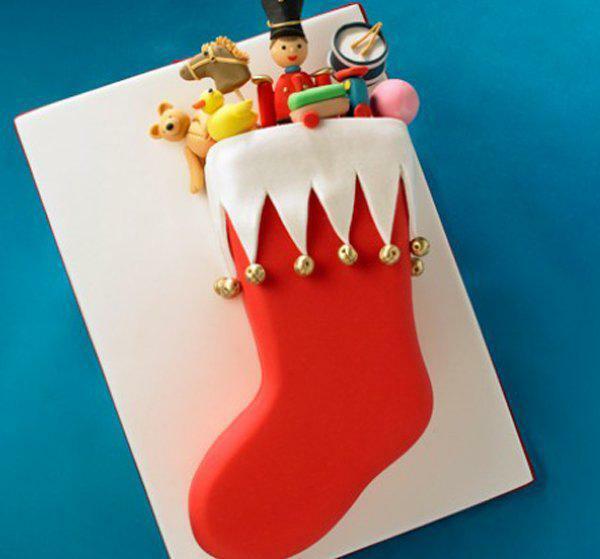 The cake is designed to look like a Christmas stocking all filled with Santa’s toys. Frozen inspired Christmas cake. 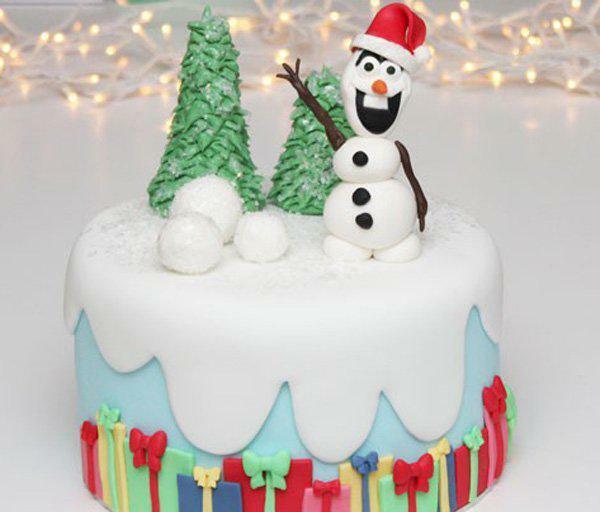 The cake is designed to look like a snow mountain with Christmas presents lining below and on top is the popular snowman Olaf from the movie Frozen. 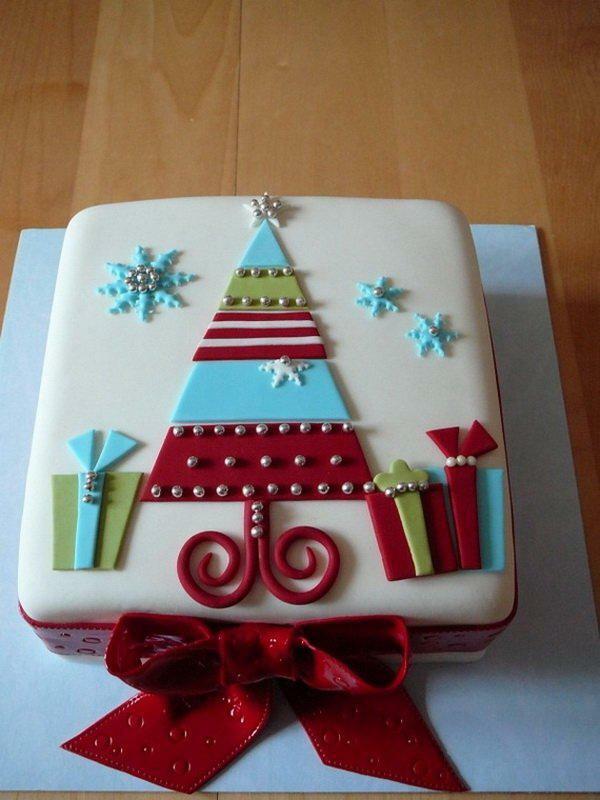 Elegant looking Christmas cake. The cake looks simple tasty and has been designed in white and gold theme making it a simple yet beautiful looking cake. Adorable muffin cake with Christmas cupcakes. The Christmas cake has been made to look like a giant muffin with Christmas balls and candy canes while below the smaller cupcakes serve as the Christmas gifts and small Christmas snowmen. Wonderfully cute Christmas cake featuring wooden cottages. 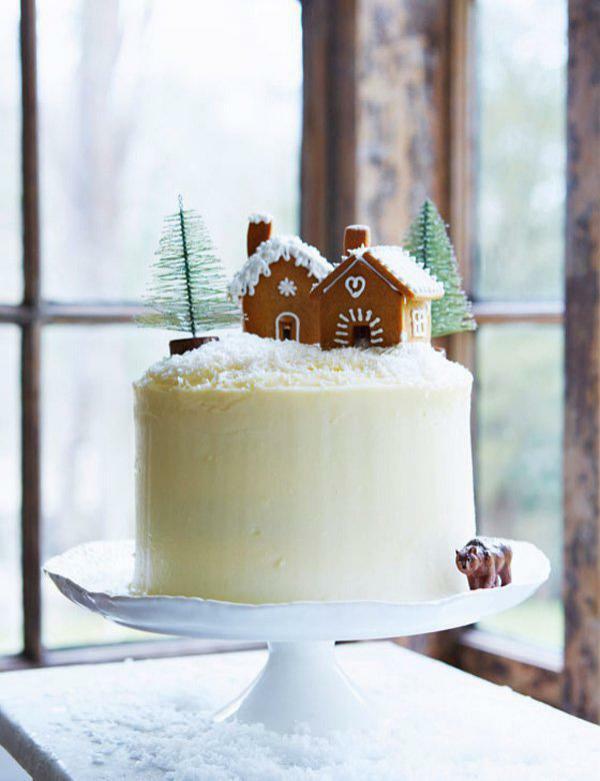 The cake depicts a scenery in the woods where there are cottages bathed in snow as the Christmas season approaches. 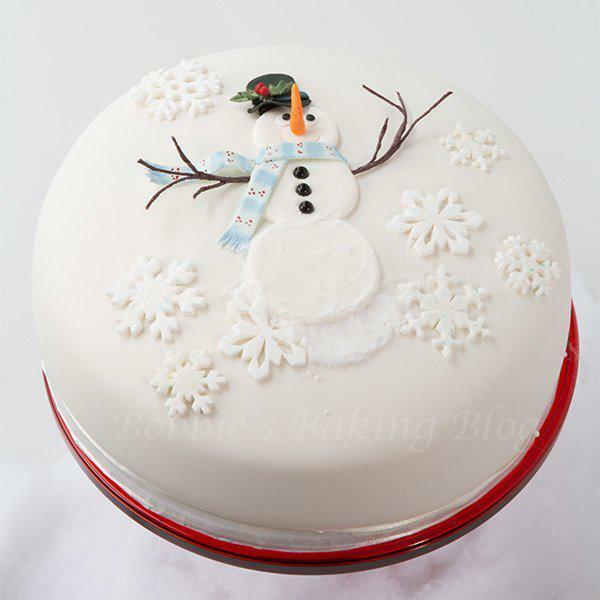 Delicious looking snowman inspired Christmas cake. The cake shows a huge snowman in the middle of the cake with a hat and scarf enjoying the snow. 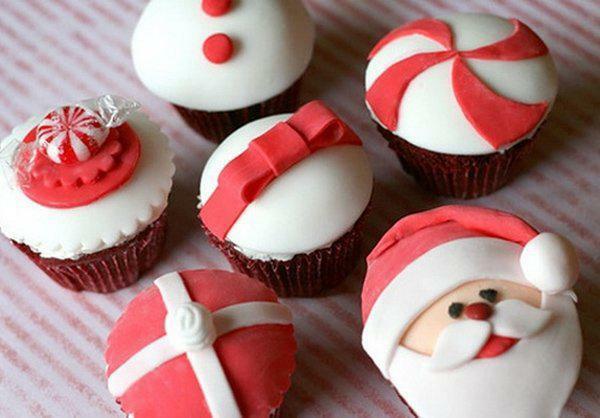 Wonderful looking Christmas cupcakes. The cupcakes show different cute faces of Santa, Santa’s wife, Rudolph the red nosed reindeer, the gingerbread man, Christmas trees, gifts an mistletoe. 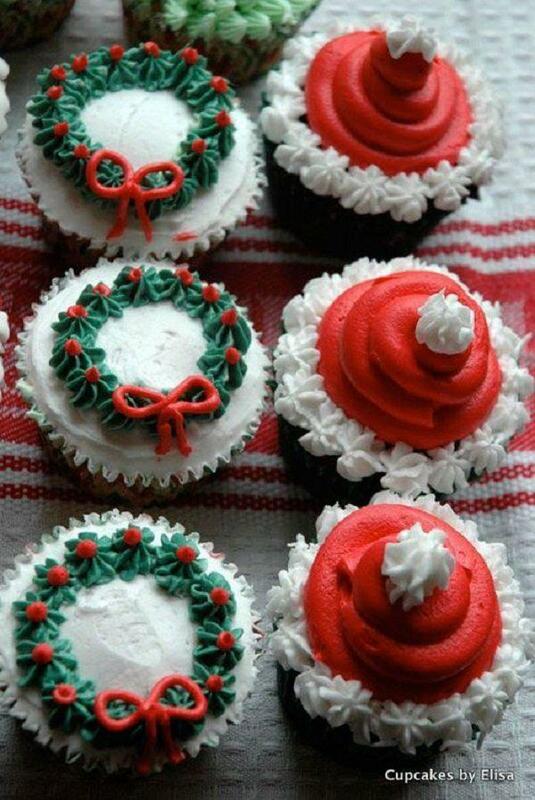 Super delicious looking Christmas cupcakes. 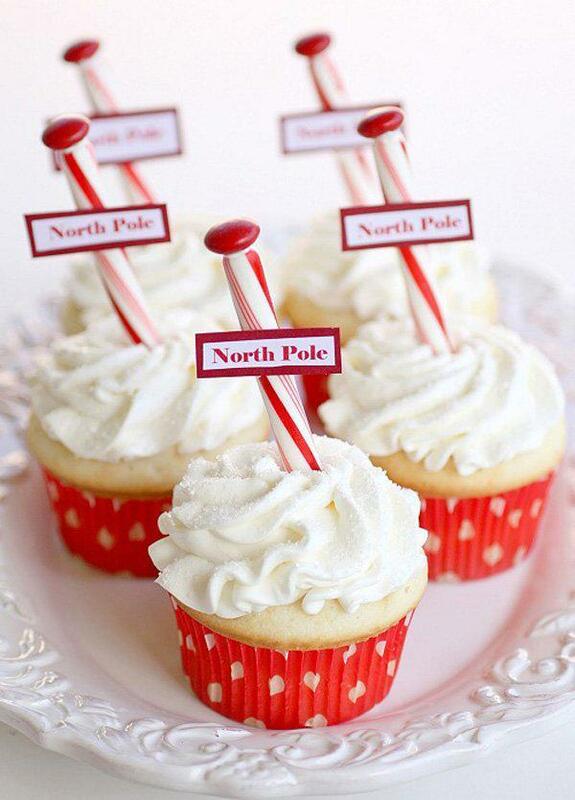 The cupcakes are labeled north pole as they are decorated in white vanilla icing with candy canes and candy on top. 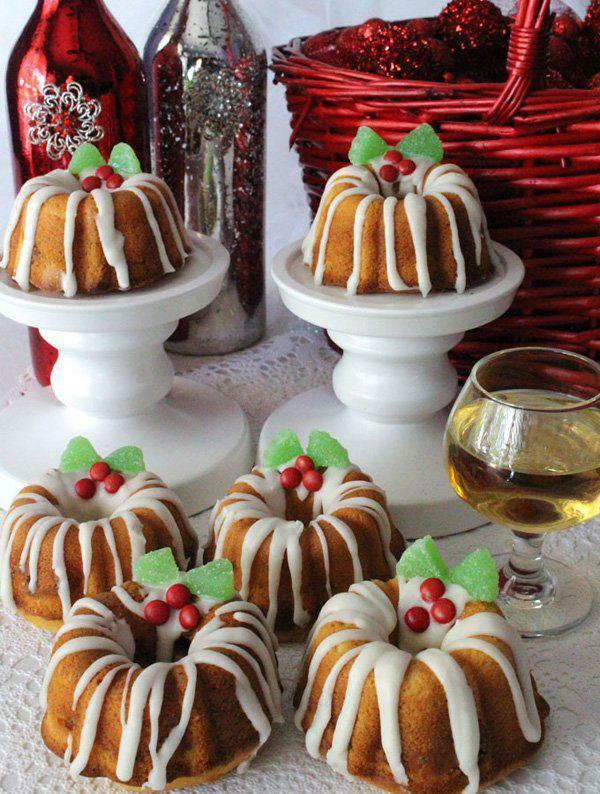 Mouth watering Christmas mini cakes. 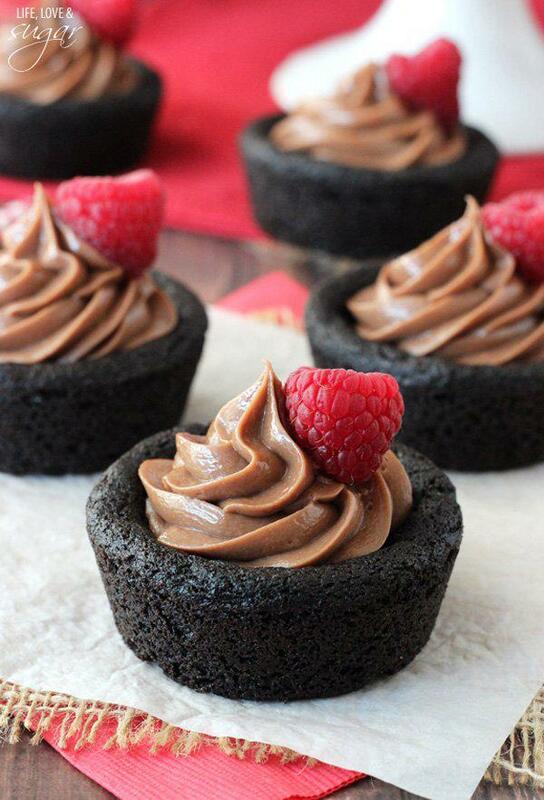 The chocolate mini cakes simply look ravishing under that chocolate icing and raspberry toppings. Christmas balls inspired mini cakes. 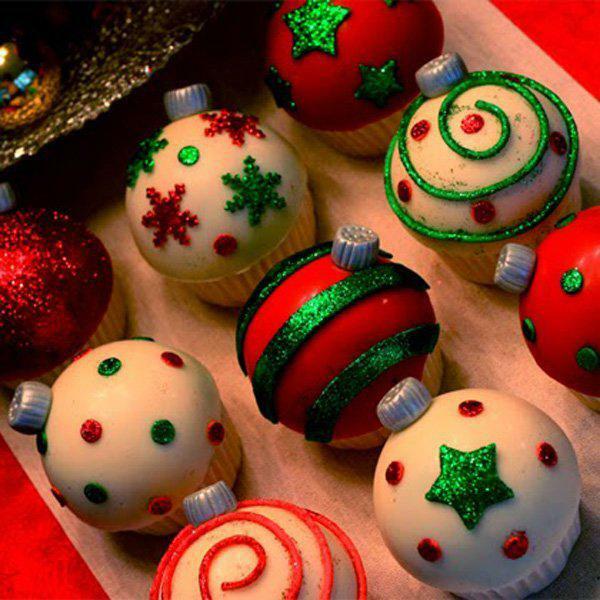 The mini cakes are creatively designed to look like Christmas balls in various colors and patterns. A two layer gift inspired Christmas cake. On each layer, the cake is decorated with several colorful gifts while on top you can see a Christmas tree surrounded by more gifts.